My Personal Space – Helen, Naturally! How is your Monday treating you today? Man how I love the public school system/state pay!! Today I am going to share something with you that has me so excited! It is all about my own personal space. I mean who doesn’t need their personal space? This will be a two part post so just bear with me on the awkward transitions! Let me clarify this a little, I am talking about my own personal space in the house that is designed for me and only me…as in dressing area! Yep, I put the hubster to use this weekend with a few house chores. One of those chores included moving the chest of drawers out of our closet and into the “play” room. 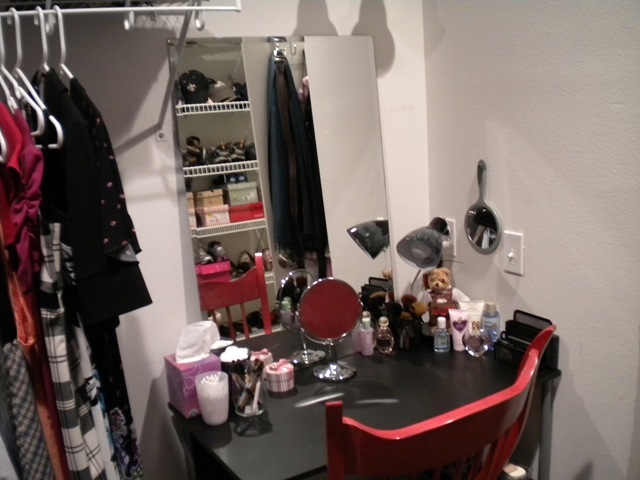 Our closet is designed to have a vanity area in it. The light fixture and outlets were part of the original house plans, I for some unknown reason to me have never taken advantage of that. Until now! So like I said – a work in progress but a very good start! I will begin introducing other posts into my blog over the course of the week leading up to the big day** Oct 9**, which brings me to the second part of My Personal Space. 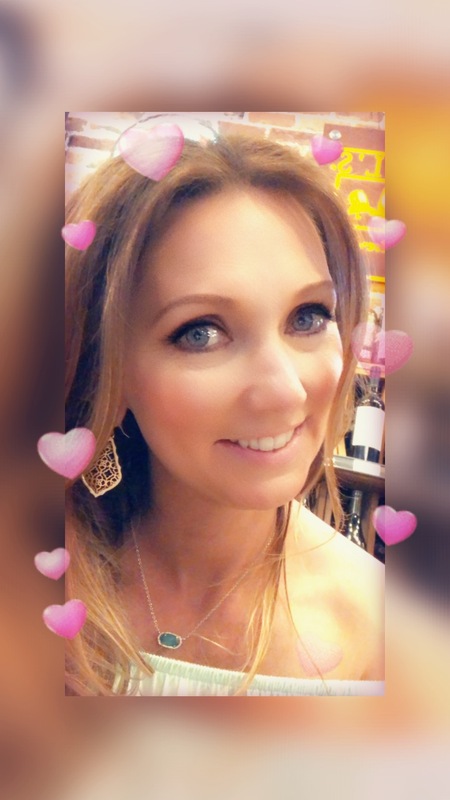 This little blog is my personal space to share with all of you. I feel that it is time to really make it my own. Of course I’ll still read!!! It’s hard to write about one thing and one thing only. I didn’t really ask my readers if they minded if I posted about things other than food I just did it 🙂 People like to read about whatever you’re passionate about writing about. I’m not going anywhere! 🙂 I always really enjoy hearing about other aspects of bloggers lives, it really makes me feel as though I’m getting to “know” them. 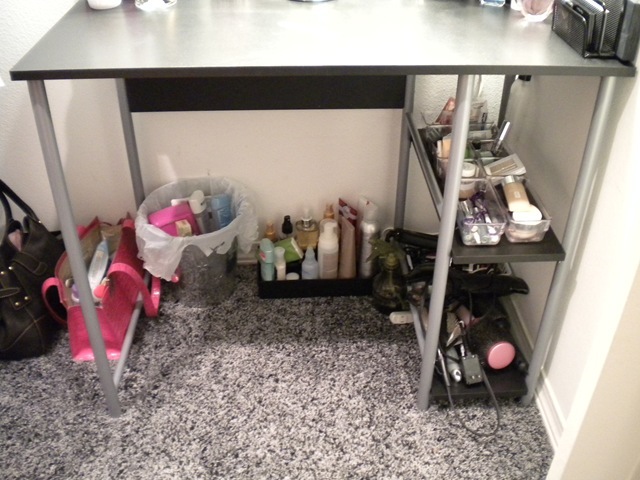 I use a desk as my vanity, too! Vanity’s are way expensive. My hubs had an old desk from high school that was in his parents house and I totally stole it for my hair and makeup purposes. It works great! Ha you are right, I procrastinate while dressing now! A happy living blog? Wow. That’s so lame. It’ll NEVER work. Ha! Can’t wait to see where you go with this. Love the vanity, by the way!